Inlays and onlays are similar to crowns but are smaller and used when a tooth-colored filling will not be strong enough but there is enough tooth structure remaining that a crown is not indicated. Inlays and onlays are generally stronger and longer lasting than tooth-colored composite restorations. The process is the same as for a crown. There are several types of crowns, inlays, and onlays, including gold, although porcelain (tooth-colored) crowns are the most popular because they resemble you natural teeth. They are highly durable and will last many years, but like most dental restorations, they may eventually need to be replaced. Porcelain crowns are made to match the shape, size, and color of your teeth giving you a natural, long-lasting, beautiful smile. 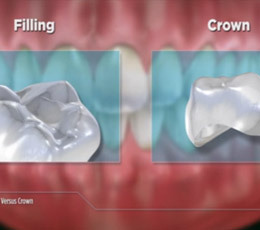 A crown, inlay or onlay is a two appointment procedure. At the first appointment we will numb the area and prepare the tooth for its new restoration by removing any old failing filling material and decay. We then take several highly accurate molds (or impressions) along with other records that are sent to a local laboratory (we have one on site). You will leave with a temporary restoration in place that will cover and protect the tooth while a skilled laboratory technician fabricates your new restoration. 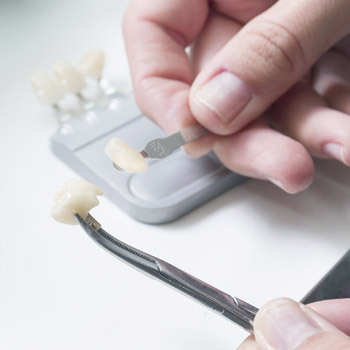 At your second appointment the temporary restoration is removed, the tooth is cleaned, and the new crown, inlay or onlay is carefully tried in to ensure that the spacing and bite are comfortable and accurate. We then cement the new restoration permanently and give you instructions on how to care for it. Remember that it is important to maintain regular recall visits to ensure the longevity and success of your new restoration.